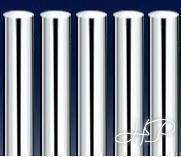 Suitable for Linear motion series, Hard Chrome Piston Rod, Guide-Rods, Guide-Pillar, Guide-Cover, Shaft of the Bearings, Knife-Wares, Machinery Pillars, etc., among by Bearings, Shafts as the typical ones. It also reasonable for various kinds of Precision Mechanical, Auto-machines Parts. ﻿●﻿The rods made by SAE 52100 /JIS S45C / DIN 100 CR6 material, which belongs to a High-Capacity Carbon Steel; it has good wear-resistance ability and higher hardness degree.